I want my muse to feel welcome here at my studio, so I decided I’d build her a mixed media house of her own for the StencilGirl and Eileen Hull Designs blog hop! I started with the roof. I grabbed a sheet of paper made during some stenciling play and cut strips of scallops from it. Just some of the stencils in here are Eddy Rose, Seeds, Wonky Eyes, Scribble Scratch, Straight Stems, Greek Border, and more! Using Eileen’s Die-Blocks/Cubes 3 Sizes Sizzix die I cut 3 pieces of mat board. I stamped on 4 of panels with Eileen’s Barn Wood stamp- since those are the only ones that will be seen my touch of experimentation on side #5 won’t show. Using Dylusions spray inks, I covered both sides in yellow. My muse needed a welcoming walkway and the center curve of Zen Landscape stencil was just what I needed. When assembling my muse’s house I left it open on the sides for a very important reason. I wanted to be able to slip notes of gratitude in there in appreciation of all that my muse does for me. My life is so much more complete when I am creating, playing with color, and exploring thanks to my muse! This is a week long hop so there’s plenty of inspiration to be had! And yes, a giveaway too! Leave a comment on this post to be entered to win and if you’d like more chances, leave a comment on any and every blog post in the hop this week! Of course, just one comment per blog please. And it ends Sunday at 11:59pm CST – so get your comments in before then! What a great Idea. Maybe in need one for my source of artistic inspiration. Very bright. Wow Carolyn, loved your house, it’s so cute, and loved that beautiful stencil collage on your roof! I think any muse would be very happy to have such a colorful house made with love! what a wonderful idea, and something i will be adding to my new art studio hubby is making for me in a part of our cellar. no worries, it has huge full sized windows, so it wont be a dungeon down there. i would love to add some stencils to my supplies, as i only have one! WOW Did you ever rock those stencils Carolyn!!! I love how you cut them up and rearranged them! Awesomeness! And your lil house is adorable! I think I saw my muse peeking out of the window. I love this. I love the colors used. You ROCKED this!!! I love your house!!! The muse’s house is awesome! I love the vibrant colours. Such a great idea with the gratitude notes too! Thanks for the inspiration! I love watching your art work and often watch your Youtube videos while commuting to or from work. Great use of your playing!! What a great idea! I wonder if my muse hasn’t felt welcome in my home. Time to change that! I love that you built a home for your muse! And what a fabulous house it is too! What a great idea. Love the results. Great instructions, too. I love your ideas! My muse would love her own house! Another colorful and fun project, Carolyn! I love the idea of a house for your Muse! Thanks for sharing. I love that house. It would be great for all kinds of things: prayers, thank you notes, concerns, etc. Must make one. Thanks. So clever and adorable! Love the walkway! 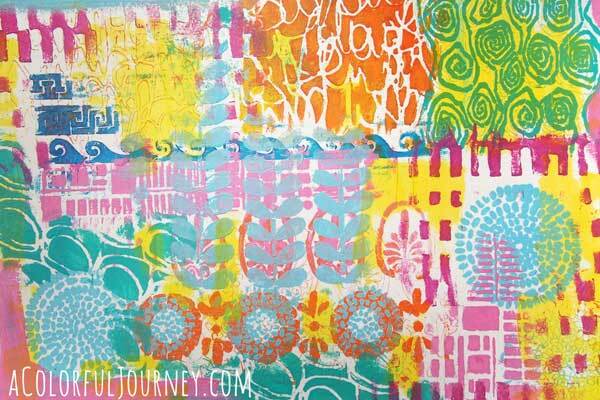 love LOVE LLUUUUURVVVE that ZEN LANDSCAPE ….soooo different than 1000 other stencils !!! well, to me anyway it is. BLESSINGS ! Ooo I love your house! Makes me want to build one for my muse! Carolyn, every Muse needs a place to be welcomed and thanked. Yours is surely blessed to have such a beautiful home. Great idea and fun project! Will have to attempt one of my own. Nice to meet you in person at Stampaway. What a cute idea, Carolyn. 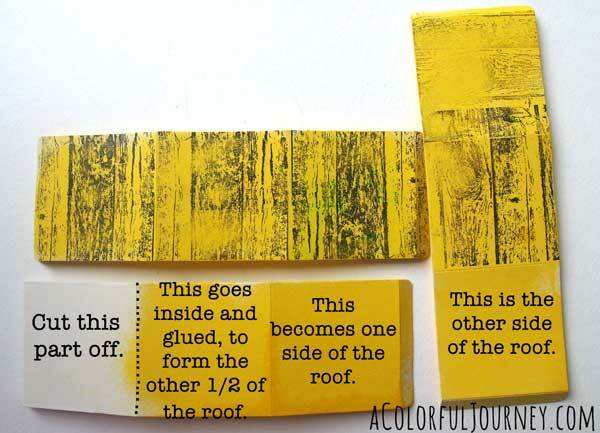 I love all the colors you used for your roof’s shingles! Your blog is truly a colorful journey for me! Oh my goodness, Carolyn! This project is toooo cute! I have no doubt that your ‘muse’ will love her brand new house. How nice of you! You have such a clever way of working with stencils. Your muse will never leave home with such spectacular accommodation! LOVE the shingles. Your muse will be very happy with her house.It turned out adorable.Love the painted paper and the shingles and the walway.Very cute. I want a house like this but for me! is so beauitful, full of color, I love it! This is a delightful idea! So glad you shared it. As usual. your colors are fresh and inspiring. Thanks. I love the idea for your project! I think your muse is bright and happy! What a fabulous house! Love the all the colour and that you left it open as a space for little notes. Wow, adore the hop, this is soooooo adorable, thanks for the inspiration. What an adorable house. My muse has been inspired. I guess having her own home is better than what they would have done in the old days to keep their “women” home…barefoot in the winter and pregnant in the summer! Ha! Take *that* you old muse, You! On a more serious note, Carolyn, I love your wee house! This is very pretty, Carolyn — I especially love the way you did the roof! wow, maybe I need to build a house for my muse too so she stays around longer 🙂 Great project. Love the little house. It could be adapted for so many things. Would make a great “village” for Christmas, a gift holder,…..
thanks for the idea and the directions. This is the most darling little house ever!! I think you’ve just come up with a great gift idea–‘wish houses’ or ‘prayer houses’ that you can make and give with the idea to write little notes and drop inside!! Fabulous, Carolyn!! I think our Muses can use a little thanks!! This is a Wonderful creation for the EH/SG Blog Hop! I’m glad I’m hopping along! XOXO-Shari T.
I always enjoy seeing what you’re up to, Carolyn. Love the house. 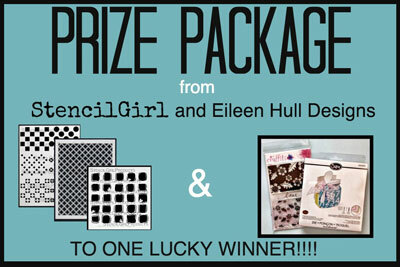 Thanks for a chance to win the prize package. The colors on the roof are wonderful! The zen stencil is has so much potential. What a creative and inspirational project! Always love your colorful playful creations! The candy colors in your little house are yummy! Haha Carolyn! You never fail to inspire! Perfect, just perfect!!! 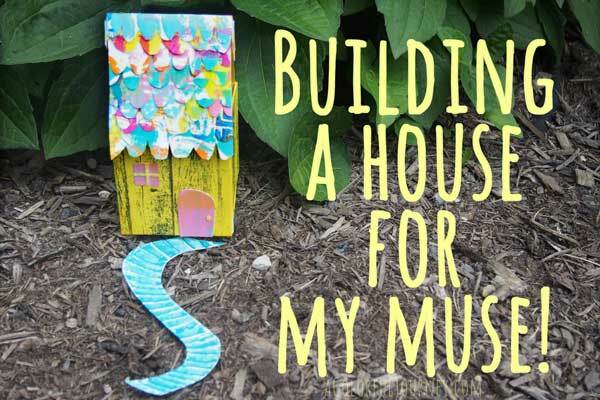 Every Muse needs a home, and quite the charming abode you created, Carolyn. She will be most happy residing in that colorful, open air cottage, as long as you keep feeding her!!! Adorable little houses! The stencils are great too. Thanks much for the tutorial. Will have to try making some myself. Love this cute house! Awesome colors and textures! What an interesting technique to do the roof for a fun little house! Great giveaway! Thank you for all the inspiration . What a fun project, love the tile roof! What an adorable house for your muse! Love the idea of leaving it open! That paper you made is swoon worthy. I hated to see you cut it up but I think the ‘parts’ made it even better (if that is possible). Loved the house. The roof with all the stencils awesome! So Stinkin cute!! I want to take this one step further and make a birdhouse now! Love it! So stinkin’ cute! Love the idea of keeping the sides open to slip notes in. This is something that I could make with the kids at work. Thanks Carolyn! 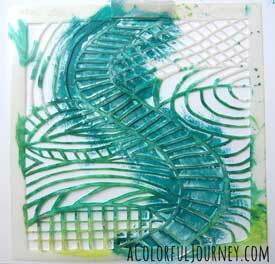 The zen landscape stencil is really cool! Love your beautiful muse house of welcome. I hope she is as good to you as you are to her,a house! You always crack me up!!! I would love a house like that for ME!!! So colorful (which totally reminds me of your awesome work!) 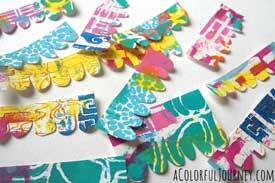 I just love the way the stencils worked with the stamps and the dies. I did not even know about those awesome stamps! Thanks for sharing, a unique welcome to your muse! Hi Carolyn! I LOVE this little house! I don’t have the diecuts, but I can make a box anyway. I will be doing this and will post my result later on for you to see. What a beautiful little house! Love the papers you used! Yahoo! I want to win Miss C! Your muse is a kind a generous one. When it feeds your creativity, it also feeds mine! Love your little house of gratitude and all the gorgeous stenciled color. Thank you! What a lovely idea! I will have to create a spot to welcome my muse! Wonderful little house! Your muse will be very happy. What wonderful and corolful house for a muse! Smart idea and love the little house! WOW Carolyn you have done it again! I love houses and you have made this house so cute and colorful. As always thanks for the inspiration. How fun! 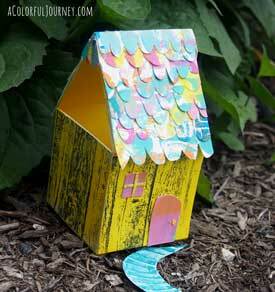 Love your whimsical house, and such a creative use of the ATB die. What fun! I find a day without playing with my art is a dry, dull day. I’d love to win the giveaway so my muse can try something new. Thanks. What a near idea. Love it! LOVE the zen spiral walkway.